Now available 3 cd set! 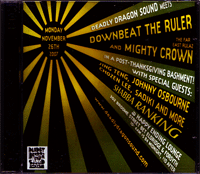 This is the live recording of the now legendary November 26th Deadly Dragon Bashment live at Happy Ending with DownBeat the Ruler and Mighty Crown with Special Guests live on the mic...Jing Teng, Johnny Osbourne, Chozen Lee, Sadiki, SHABBA RANKING, Major Mackarel, Sammy Dread and More! This was the best party of 2007, so LISTEN up!! !